...and the last finished quilt of the year. Most definitely; no I will not do another one for this year. But maybe start one ? I dunno....perhaps my sister is right when she asked yesterday if I was already on cold turkey. Sunday morning I finished the last stitches on this commissioned quilt. The brief for this quilt was to use blues but other than that I had free reign on the design and that is what I love best at times. I came up with the design on my way home from dinner at my brothers. Him and his girlfriend have similar colors in their living room and from a design point of view I wanted to do something very modern, uncluttered, yet striking. 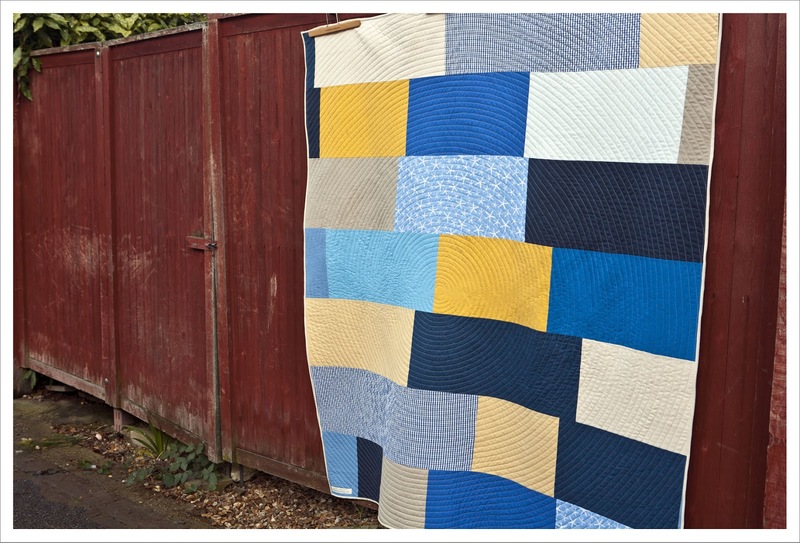 Inspiration also came from this quilt, Katie 'from the blue chair' made a few months ago. I didn't use a pattern but drew a rough design on a piece of paper, then laid out a bed sheet on the floor that I folded to the same size as the finished quilt was supposed to be (1.8 x 1.6 m/ 70" x 63") and started to sew and arrange log cabin blocks until I had a composition I was happy with. I then filled in the space between the blocks for which I used mostly strips of 2 1/2" width until I had a rectangular around the log cabin blocks. 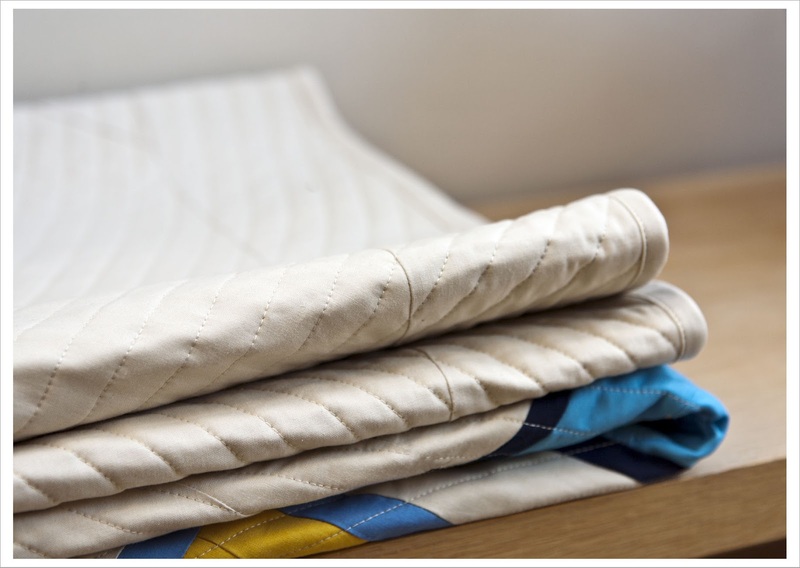 The final but most difficult part was to add solids until I had the desired quilt size. Difficult was that I ended up sewing large solid pieces on the bias and we all know what can happen with that. Let's say it took me a while to get this one square and a lot of measuring and resizing was involved. I kept the binding simple as I wanted to give a feeling of infinity when looking at the front of the quilt. The background fabric including the binding is Kona Putty which I absolutley love as it has a very soft cream undertone somewhere in the middle between off-white and proper cream. Very subtle and beautiful. 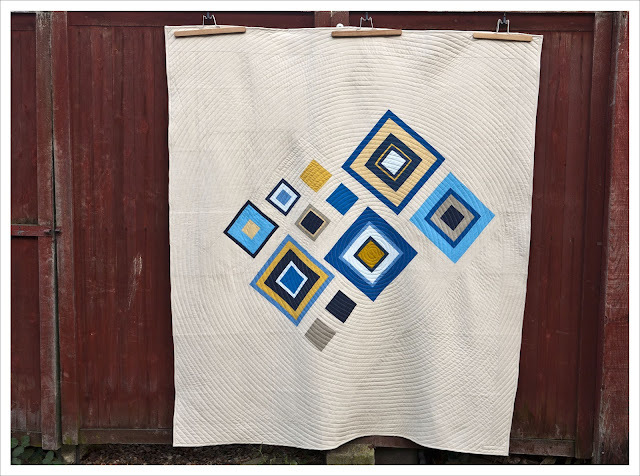 Do I love this quilt ? Oh yes I do very much and it is most definitely in the list of favorites of the year. I will be a little sad to see it go but I guess I can always invite myself to another dinner at my brothers' and check-up on "my"quilt. 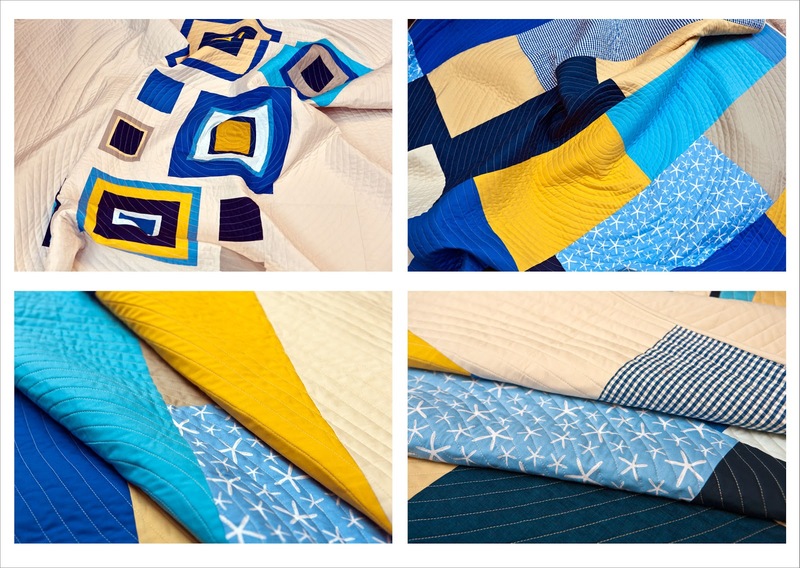 I love everything about the quilts, colour choice, fabrics, composition and quilting. Very modern, but timeless too. Might just have to make something like that for myself! What a shame you have to give this away - haha! Another beautiful finish, I love it and I'm sure your sister in law will love it too. Happy Christmas! I love this quilt so much! It might be my favourite of any you have ever made. fabulous quilt and I love the back too, the circular quilting really adds to the texture. I'm sure your brother will love it! You are definitely ending the year on a high note. this is fantastic. I love all the negative pace and the quilting as well as the back. All perfect! Beautiful quilt! 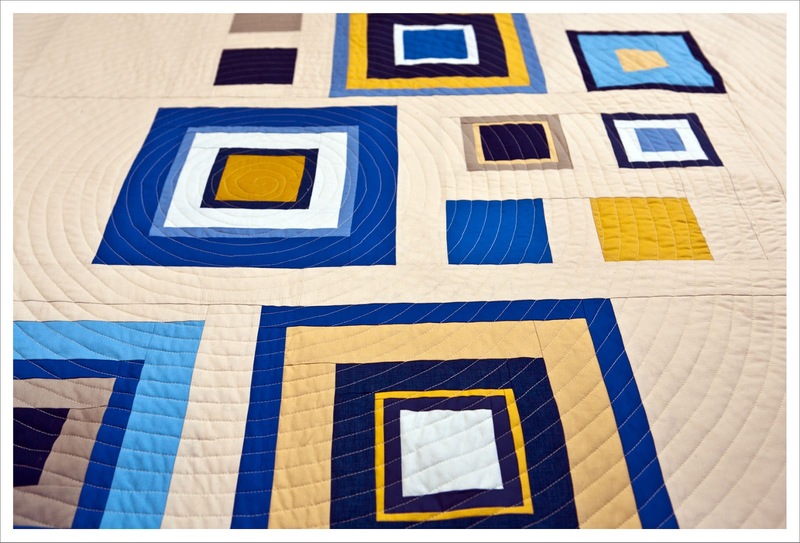 Now that I've done this kind of concentric circle quilting (and only on a mini!) I have UTMOST respect for your quilting skills! LOL. I can't imagine doing it on a larger quilt like this! It looks AMAZING. I love it! It's turned out so well. I think the spiral quilting is perfect. It softens it, adds to the infinity feeling, and if you had tried to go diagonal I reckon you would end up ruling the decisions if it didn't end up parallel or perpendicular to the piecing. And good on you getting those huge bias seems done, shudder! Days later and still looking at this! It is seriously SO lovely!!! Well done!